The narrow Missouri Route 127 bridge across Interstate 70 was never intended to be crossed on foot. As I walked over the bridge, the lack of sidewalk or even a shoulder more than several inches wide made the approaching pickup truck swing a wide arc across the double yellow line as a courtesy to give me more room. Gusts of airflow buffeting from high-speed trucks passing under the bridge did little to mitigate the Midwest September heat radiating from the blacktop. I picked up the walking pace to get off this patch of pavement more quickly. A bottle of iced tea and the air conditioning inside Casey's General Store in Sweet Springs, MO helped combat my body heat as beads of sweat combined to create an uncomfortable flow down my face, neck and spine. My 2016 Nissan LEAF was parked at the I-70 Community Hospital on the south side of the Interstate charging its battery on one of the 7 KW ChargePoint charging stations, the only ones in about a 30-mile radius. With no real traveler services at the hospital and one hour of planned charging time, I had chosen to walk to one of two convenience stores on the other side of the highway. 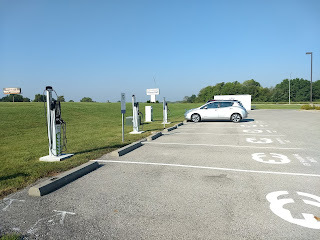 This charging stop turned out to be much less pleasant than the one earlier in the day, where I had spent a leisurely hour having breakfast, sipping coffee, and surfing the Internet at a McDonald's in Lexington, Missouri. At the Lexington location, I was occupied with my time spent on an Egg McMuffin, hash browns and coffee listening to the locals talk politics. I also connected to the free WiFi on my laptop checking news, social media, and updating the trip data for the future blog essay. Back to the hospital location, I was grateful Kansas City Power & Light's Clean Charge Network extended beyond Kansas City city limits even if it only provided 7 KW as opposed to a 50 KW DC Quick Charging station. 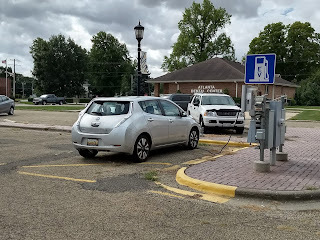 Nonetheless, it was relatively inconvenient to pair my charging with a meal, a cup of coffee, some shopping, or other activities while the car charged. This experience vividly highlighted for me that charging locations for EVs, particularly those along travel corridors, need to be in a place where there are things to do for the driver. The decision makers who placed the early generation stations were likely well-intentioned, but had no clue about the realities of EV charging. Why The Obsession with Road Trips? I love to travel and particularly enjoy road trips. Given the new paradigm of electric vehicles and the fact that I recently sold my last internal combustion engine (ICE) car, I prefer to take these trips using EVs. The end of lease on my 2016 Nissan LEAF is approaching this year, so I'm starting the decision-making process of deciding whether to keep the 100-mile-range LEAF or upgrade to another EV that is more capable of road trips as a stable mate for my 2015 Tesla. When I had posted about my plans to transport my 107-mile-range LEAF electric vehicle from Kansas City to West Michigan, one comment I received was (paraphrased) "Wrong tool for the job. You'll be miserable. Pay to have it moved." While I didn't disagree with the first sentence, I was not to be dissuaded from the endeavor simply because this trip was a unique opportunity as a learning experience. Road tripping in an electric vehicle other than a Tesla was discussed in the Electric Vehicle Road Trips blog essay from August 14, 2018. Unfortunately I had neither available for this trip, which is precisely how less-than-ideal charging scenarios like the I-70 hospital and hanging out in a campground plugged into a 50A RV circuit came to be the only viable alternative (other than paying someone to move the car). Read more about planning and executing this road trip in the August and September 2018 essays. 2019 - What Has Changed? Fast forward to January 2019. A new generation of longer-range EVs is hitting the market in 2019. The Hyundai Kona, Kia Niro, and Nissan LEAF ePlus, all equipped with battery capacities around 60 kWh and 200+ mile range, join the Chevy Bolt EV as affordable long range EVs. These cars open up the possibility of electric vehicle road trips for the average driver not ready to part with $75,000 or more for a high-end Tesla Model S or X or even a mid-range $45,000 Model 3. I will mention Jaguar, Audi and Mercedes but while those models are out there or coming soon, they are hardly more affordable than Teslas. 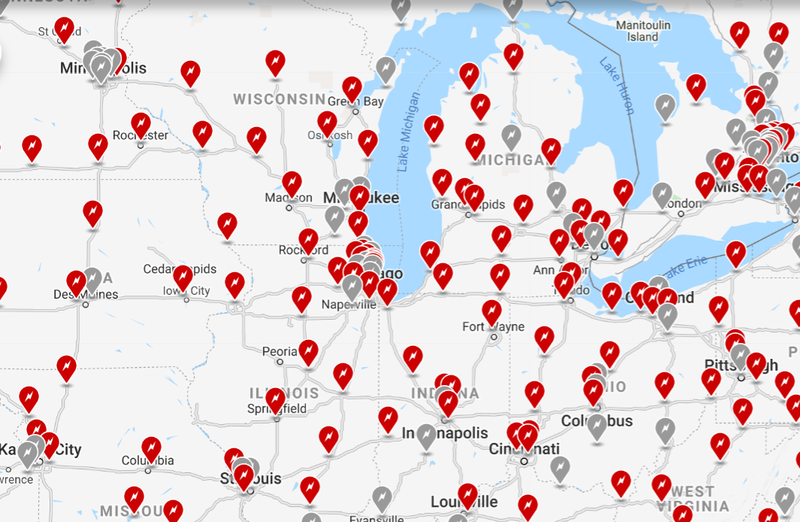 Follow EV reviews and social media comparisons of longer-range EVs and you'll eventually see the argument that Tesla holds the ace card with its Supercharger Network. The InsideEVs article Here’s Why Tesla’s Supercharging Network Will Prevail goes into more detail. 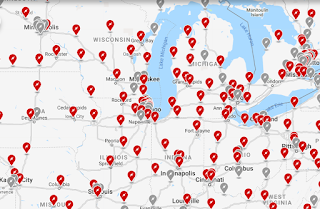 With nationwide US coverage of Superchargers locations spaced only 80-120 miles apart, multiple chargers at each location and 120 KW of peak charging power, Tesla road trips along these charging corridors are not only feasible but practical. Until other networks catch up in terms of charger placement relative to travel corridors, location near services for drivers, reliability and ease of use, Tesla will indeed continue to have the advantage. So what if you don't have a Tesla and still want to road trip an EV? Short of punting and renting an ICE vehicle, there are resources to make it work. Just make sure that you as the driver are not taxing the patience of your family, who may not be nearly as gung-ho as you about electric road trips. I'm pretty sure my wife would not have tolerated the I-70 hospital charging session easily. My usual go-to app is PlugShare, which provides an overview of all stations as entered and rated by individual users. Level 2 stations (usually 7 KW, see also earlier essays for details on what the charging levels mean) can be found marked in green, home stations that people are willing to share are blue and DC Quick Chargers are marked in orange. Filter out the Tesla Superchargers and there isn't a lot of orange left. Level 2 stations shouldn't be discounted for road trips despite only providing 20-25 miles of range per hour of charge. First of all, they are very useful for overnight stays at hotels. In fact, since slower charging is typically better for longevity of the battery due to lower heat production, it's the preferred way of charging overnight. 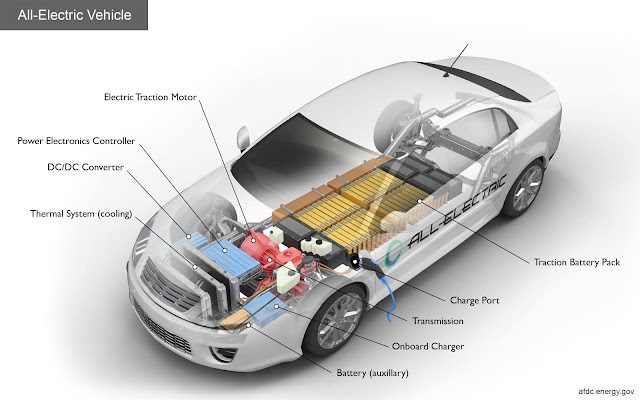 The charging rate is more than enough to recharge even 60+ kWh batteries to 100% charge. I'll go into more detail on hotel charging in a future essay. My LEAF relocation trip example shows that even an hour spent here and there on a Level 2 charger can give you enough range to bridge the gap to the next DC Quick Charger. 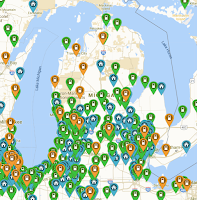 In the case of the LEAF trip, the density of DC Quick Chargers in that part of the country was (and remains) so sparse that the next charger may well just be another Level 2 and a 3-hour charge. That situation just isn't acceptable for the majority travelers. 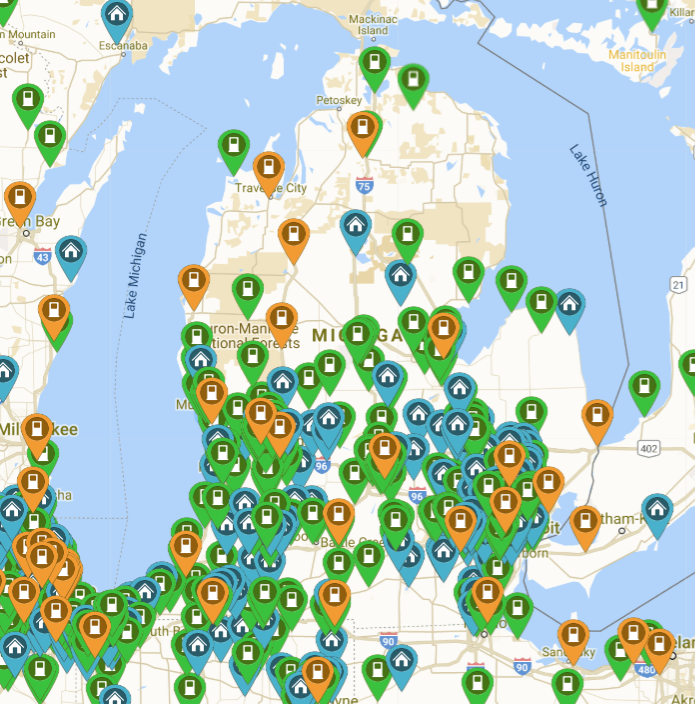 In the Midwest, EVGo seems to be the prevalent network that maintains DC Quick Chargers. Enter Electrify America (EA). Born out of the Volkswagen TDi scandal and the associated settlement funds, EA is building a network of DC Quick Chargers intended to allow long-range EV travel with 50 -100 KW fast chargers capable of charging up most of this new generation of EVs to 80% in 30-45 minutes. Charging rates of up to 350 KW are already being discussed. As the map on the left shows (detail available at the EA site), there are still significant gaps during the construction phase. While the 200-mile trip from West Michigan to Chicago's O'Hare airport is already practical, a trip from West Michigan to Pittsburgh, PA (where I have family) is already a bit more tedious. There's a reason why Tesla has a devoted fan base. Tesla has gone about their Supercharger placement in a manner consistent with the needs of their drivers. 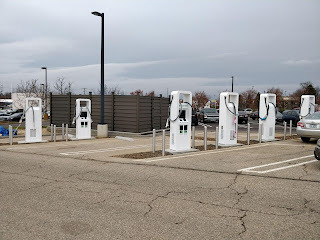 The locations make sense both in terms of placing the chargers along travel corridors such as interstate highways as well as near stores and restaurants where the drivers and their passengers can comfortably combine a charging stop with a meal, coffee, or light shopping. A good example of such well-planned Supercharger locations is the Midwest partnership with Hy-Vee grocery store chains. 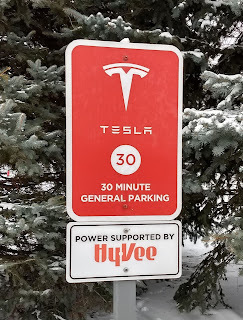 If you travel through Iowa along I-80 with your Tesla, those little red Supercharger icons on your car's navigation screen are nearly all at Hy-Vees. The ability to do your weekly shopping or even just picking up a snack is not the reason these locations are so useful as a charging stop. Hy-Vee has outfitted most of their stores with a full-service Market Grille restaurant, premium coffee kiosks like Starbucks or Caribou, and counters where you can pick up prepared food including comfort food, pizza, sushi and even Mongolia BBQ. Couple this with 24-hour access to clean restrooms and free WiFi, it's easy to spend 30-40 comfortable minutes here while your car is gorging on electrons. Tesla has a similar arrangement with Meijer stores in the upper Midwest which have very nearly services as Hy-Vee. Other locations are placed at or near shopping centers that allow the car's occupants to partake coffee, food, and other shopping. Contrast this to the I-70 hospital in the middle of nowhere. 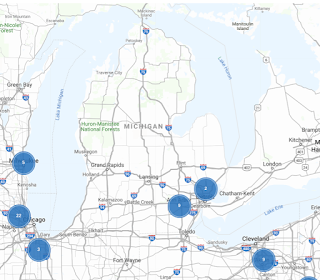 My encounters with EVGo DC Quick Charge locations have been mostly in the St. Louis and Chicago regions. In St. Louis, EVGo partnered with Commerce Bank locations which are typically in shopping centers. The Chicago area location I used was at a toll road "oasis" rest stop that also had restaurants and traveler services. Each had only one charging station, so I was reluctant to leave the car for long in case another power-needy car pulled in. While not quite as comfortable as the Hy-Vee or Meijer locations, these types of placements are also reasonably good in terms of traveler services. 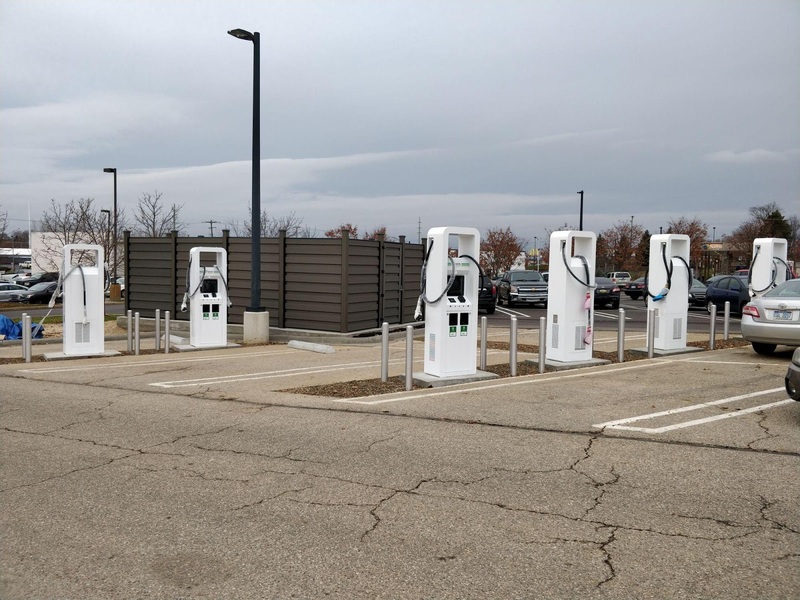 EA DC Quick Charge locations such as this Walmart location found on PlugShare (not open yet as of this writing) and others close to Casey's General Stores have also been researched and executed better than the first generation of chargers. One fundamental advantage over, say, the EVGo and ChargePoint locations I have used, is that each location has multiple chargers. This helps with the anticipated increasing demand as well as redundancy in case one charger has technical issues. 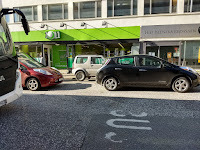 Since EA was born out of VW funds and European manufacturers favor the CCS quick charging standard, there have been some complaints that EA stations have mostly CCS connectors and fewer CHAdeMO charging connector favored by manufacturers like Nissan and Mitsubishi. From a North American viewpoint, Tesla is still the king of EV road trip cars in the US. If you have the necessary funds, a Tesla will provide the easiest and most seamless road trip experience. It's worth noting that equipped with a CHAdeMO adapter, a Tesla Model S and X (but not the Model 3) can access any of the third-party DC Quick Charging networks. Of course all Level 2 stations are available to Teslas via the included adapter. The next generation of 60+ kWh (and arguably 40 kWh) EVs, when coupled with the ever-growing DC Quick Charge infrastructure, can already take road trips. With some careful planning and depending on the location, such trips are already possible and in some cases, convenient. Planning tools such as the PlugShare Trip Planner (as discussed in an earlier essay) are still essential until the charging infrastructure catches up with gas stations and we can drive blissfully onto the open road assured that there's a charger somewhere out there. I also highly recommend backup charging locations and contingency planning such as extra time and possible impromptu hotel stays. If all of this stresses you out or delays have the potential to ruin a trip, then consider using your own or rented ICE car that meets your trip needs. The savings from regularly driving an EV will likely pay for the occasional rental for special transportation needs. After all, not everyone owns a 24' cube truck just in case you might have to move one day. If you travel extensively, perhaps a plug-in hybrid vehicle (PHEV) makes more sense until road trip charging become ubiquitous and easy. I would be interested in hearing about your EV road trip experiences and tips, particularly as it relates to charging solutions.